Charles reported, "The first trip we went on was to Pearl Harbor." Here is a description of the USS Arizona Memorial (pictured here) as found on the internet: "The USS Arizona is the final resting place for many of the ship's 1,177 crewmen who lost their lives on December 7, 1941. 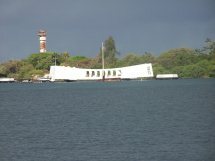 The 184-foot-long Memorial structure spanning the mid-portion of the sunken battleship consists of three main sections: the entry and assembly rooms; a central area designed for ceremonies and general observation; and the shrine room, where the names of those killed on the Arizona are engraved on the marble wall."